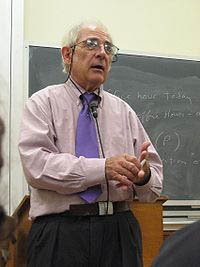 John R. Searle, lecturing at U.C. Berkeley. One of the differences between believers and godless non-believers is the following: believers see consciousness as connected to an eternal soul that survives death; the godless, on the other hand, see some connection between the mind, human emotions and human chemistry and they assume that when the body dies the mind dies. This brings us to the work of John R. Searle, Professor of Philosophy at U.C. Berkeley since 1959. Searle wrote a book, published by Oxford University Press in 2004, titled Mind: A Brief Introduction. In it Searle criticizes the seventeenth century philosopher René Descartes for his dualism: Descartes' idea that humanity's consciousness is its spiritual being and that this "being" is completely separate from the material body – that we are ghosts (spirits) in a machine (materiality). Seale recognizes the role that neurobiology plays in memory, consciousness and intentionality. Your body tells your brain that you are thirsty, you become conscious of it and get a drink of water. But rather than leap into assumption by reducing consciousness to any kind of materialist essence, Searle takes the agnostic position common to science. He is suspicious of isms, including "materialism." He writes of humans having intentions rather than just being conscious, and he writes that what matters about the mind is its "capacity for information processing." Searle holds that material causality regarding consciousness is one of those questions that science and mathematics cannot answer.